Good stories change our minds, and great stories change the world. The best stories start with authentic, accurate, and clear data. The process of translating your organization’s data into stories is a critical journey which deserves constant and intentional organizational focus. Suzie’s giving has increased sharply this year compared to the last five years. This might be because she got a new job and now seems to have more philanthropic capacity. Steve showed up all of a sudden after not engaging with us for a while. Perhaps that’s because Steve became friends with Joe recently, and Joe brought him to that program last week. Clean Water has become a trending topic for us. That’s probably because the water crisis in Flint moved people to want to learn more. We should add Susie into our board member recruitment pipeline. We should thank Joe for keeping Steve engaged. We should focus on building educational and programmatic initiatives to meet rapid response interests. When already-engaged constituents increase their philanthropic capacity, they think of us with minimal prompting. That moment of the first increased gift is the right time to ask them to consider joining our board. When friends invite their friends to our programs, that relationship will be a stronger pull than any kind of creative marketing we throw at people. This has shown us how the relationships between our constituents are the most important organizational assets we can help build. Current events help activate our constituents on an emotional level, and that force will cause them to change their behavior rapidly. Cultivating an organization which can deliver rapid response communications and programming will help us maintain an emotional connection with our community. Stories are of course the most important level, and getting the data right at the base of the pyramid will fuel those stories. But the building blocks in the middle - Information, Knowledge, and Wisdom - are where the real transformation happens. Now more than ever we have widely-available tools which help staff teams translate Data into Information, build analytics to facilitate Knowledge, and embed sustainable office processes to generate Wisdom. 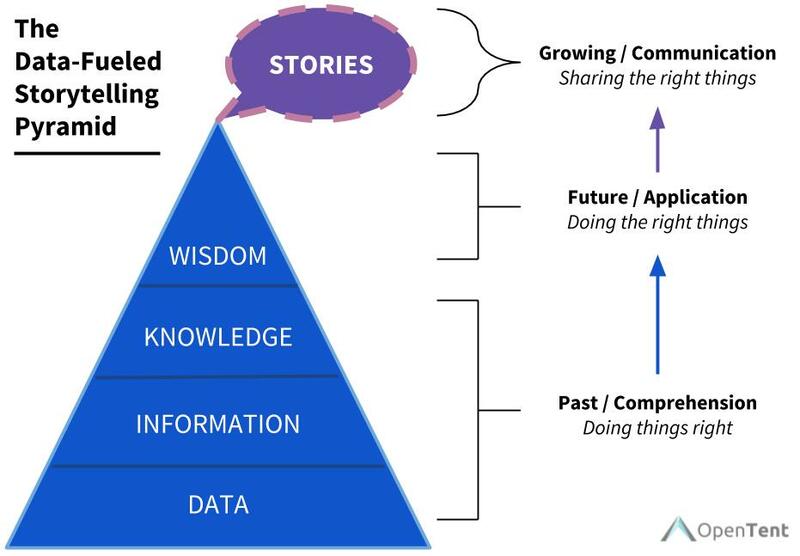 Organizations interested in telling better stories about their work should consider every step in this pyramid as equally important. At OpenTent, we work with our clients to operationalize their community engagement through a powerful CRM like Salesforce. The overeager marketing for CRMs like Salesforce seems to imply that once you start using Salesforce, you’ll sail up the pyramid from Data to Stories with just a few clicks! We have found over and over that the real work happens in the middle layers, through empowered end-users who make smarter decisions based on the Knowledge and Wisdom they glean from their CRM. For the Data-Information-Knowledge-Wisdom-Stories chain to work correctly, improvements to this process must come from the “front lines” of the staff members actually entering data and making decisions based on that information. The general pursuit of “Measurement” is important, but accurate measurement should be a delightful outcome of robust knowledge management across every branch of the organization. If we can equip constituent-facing staff with the tools they need to make smart decisions about their work each day in the office, those tools will output accurate measurement simply because their structure mirrors the work being done. The best stories resonate because they reflect Real Life from angles we haven’t yet seen. So too with the best data! Our path to launching the OpenTent Fellowship. Our clients in the news and on TV.